STOMACH ULCERS? GET THE FACTS RIGHT! Stomach ulcers, also known as gastritis is a very common gastroenterological problem that is seen in every other person. Gastro means stomach and Itis means inflammation. It is high time people get the stomach ulcers treated as it can be fatal if ignored or left untreated. Stomach inflammation is the first cause for stomach ulcers. Ulcers are also caused due to unhealthy lifestyle like excessive alcohol consumption, irregular eating patterns, stress, bacterial or viral infections, excessive intake of a few drugs, and excessive production of gastric secretions and so on. A few symptoms of gastric ulcers are perceived pain, soreness and nausea, early satiety, bloating and vomiting. 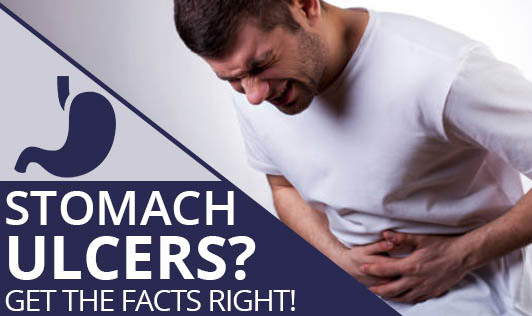 Stomach ulcers if untreated might also increase the risk of gastric cancers! Commonly endoscopy is used to diagnose ulcers. A few common medical treatments for ulcers are antacids or anti-acid drugs or drugs to improve the stomach functioning depending on the type of the ulcer. Regular meals and exercise is recommended to stay at bay from gastric ulcers. However, drugs if overused can lead to emergence of other diseases.